Welcome to the Fishing Report from Townsend, Tennessee in the Great Smoky Mountains. At 5:30 am, the temperature outside is 22.3 degrees. It will be warm today through Sunday. High temperatures in the mid to upper 50’s are predicted through Sunday. Lows will dip into the upper 30’s tonight, and the mid-40’s Saturday night. Rain will arrive Saturday night and last through Sunday. Rainfall may reach ¼” during the period. Little River is flowing at 124 cubic feet per second (cfs) or 1.75 feet on the flow gauge. Median flow for this date is 360 cfs. The water temperature is 36.5 degrees this morning. Fishing will be slow early today, due to the cold water temperatures. The streams will warm today, through Sunday. Fishing will improve, but I don’t know how good fishing will be. If the temperatures reach 45 degrees, you should catch some trout. If the temperature reaches 50 degrees, fishing should be fair to good. The temperature increase is hard to predict. All I know is, the water will warmer. My best guess is, it will reach 45 degrees in Little River at the lower elevation. As is the case this time of year, I recommend you at least start, using nymphs. I would tie on a Tellico, Prince, Hare’s Ear, Pheasant Tail or any rubber legged nymph. I would probably go with the Bead Head Rubber Legs Tellico or a Quasimodo Pheasant Tail. You might want to pinch on a piece of split shot for extra weight. Most reasonable nymphs should work, if the trout are actively feeding. Watch for a Blue Wing Olive hatch. If that happens, and you see trout rising to them, switch to a dry fly that matches what you are seeing on the water. The streams are clear and flowing fairly low. Staying hidden from the trout is essential. Dress to blend with the forest. Stay low. Don’t cast a shadow over the water you are fishing. Saturday will be mostly cloudy and Sunday should be totally cloudy. If the water is warm enough, those should be good fishing days. Tomorrow, we will be holding Free fly tying demonstrations at the shop. The tyers are both professional guides, John Oody and Patrick Fulkrod. 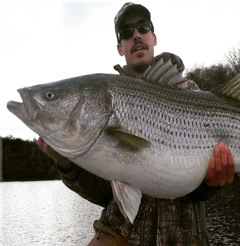 John lives here and guides clients on the tailwaters and lakes, for stripers. 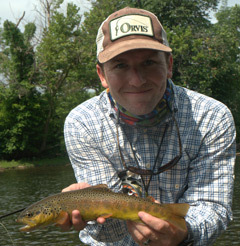 Patrick lives in upper East Tennessee, and guides trout anglers on the streams there. You do not have to be a fly tyer to learn from their demonstrations. They will be talking about their fishing experiences and tactics. They will begin at 10 am and perform until 2 pm. All you have to do is show up. Our Winter Saturday tying demonstrations are usually well attended and always informative. Learn more about Saturday’s demonstrations by CLICKING HERE. We are also holding an Intermediate Fly Tying Class tomorrow. 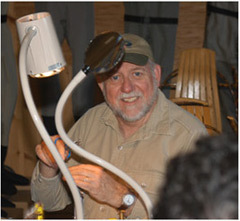 This is a trout fly tying class, intended for those who have learned to tie some flies, but want to improve their skills tying more complicated patterns. The class is limited too 8 students and I think we have room for one more. You can learn more about this class by CLICKING HERE. There you will see the flies you will be learning to tie. They are: Prince Nymph, Light Cahill, Parachute Adams, Bead Head Pheasant Tail and the Stimulator. If you want to fill the vacant spot, call the shop at 865-448-9459 to enroll. The cost for the day is $75, which includes materials, tools and lunch. Last year, Great Smoky Mountains National Park set a visitation record of 11,338,894 visitors. Visitation was especially high, due to visitors there for the solar eclipse. The prior record was set in 2016. You can read the story on the Daily Times website by CLICKING HERE. This will be a nice weekend to be outdoors. We have a lot going on at our store.